« Destiny and Sacrifice: Initiations of Santeria – by Rev. Dr. E.
A self-proclaimed Obeah woman created this “Hoodoo Bones” reading tray. The tray utilizes a symbol from Brazilian Kimbanda in the center for Exu (who she claims is the same Eshu/Eleggua from Yoruban religion – which he isn’t). The orishas have nothing to do with hoodoo. 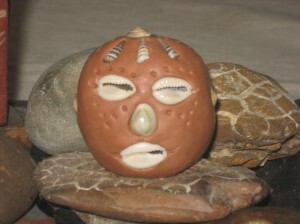 A popular phenomenon we’ve witnessed with the incredible amount of information available on the internet about Lucumí religion, is the cultural appropriation of Lucumí and Yoruban ritual elements by online merchants, Neo-Pagans and Eclectic Magical Workers claiming to be practicing hoodoo, voodoo, rootwork or obeah all at once. This phenomenon seems to be very prominent amongst professional workers who are peddling their services online, or more commonly with individuals selling “magical products” like oils, baths, incense, soaps, mojos, pakets, or even statues and sculptures made to look like orishas. This is not only completely out of alignment with traditional Santería Lucumí practice but it is very dangerous for spiritual reasons outlined below. In this article we hope to demonstrate some of the examples the members of SAFE (Santeros Against Fraud and Exploitation) have seen in the community and online, and empower the reader to effectively distinguish between traditional, real Santería Lucumí practice and illegitimate, non-traditional worship being peddled for money and little more. In our article we are mainly concerned with the religious symbols and sacred objects. One of the things to keep in mind is that there are two elements to appropriation: lack of permission and symbols being taken from someone else’s culture. In the orisha traditions, permission is granted through initiation, and culture is transmitted and preserved through participation in the tradition, or through cultural immersion in the religion and its practices. In the examples we cite you’ll see the names of Yoruban/Lucumí orishas being used, symbolism from their shrines, colors, numbers, even magical practices from other areas of Africa all being dumped together to make things “even more African” in an effort to create an illusion of legitimacy (though the people who bear the cultural origins of these different images, symbols and spirits were often warring enemies and never intermingled their religious practices). Why is Cultural Appropriation So Harmful? 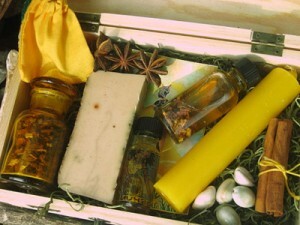 An “Orisha Box” sold by a vendor claiming it to be a portable altar to the orisha Oshun. Appropriation of orisha colors, symbols and numbers with no cultural context is another way vendors make money through cultural appropriation. Oshun is not worshipped in this manner in Lukumí nor Yoruba practice. Cultural Appropriation is harmful for several reasons. First, it harms people because it is a colonialist objectification of ancient traditions. A minority people who have suffered the scourge of colonialism have a damaged sense of ancestry, have had their lands and power stripped away from them and have often been ripped away from their traditional religious practices. Their traditions are the last thing they can truly own when their land is gone, their families destroyed and their power stripped away. When a dominant culture comes along and objectifies indigenous practices so that they become a costume, a fad, a decorating motif or the flavor of the month, the culture of the oppressed minority is ridiculed and seen as a simple object that can be shuffled about, traded or purchased for money. It is the final blow to a minority oppressed people’s soul. Secondly, these religious traditions were preserved for centuries by disciplined adherents to the faith, through hurdles to participation like intensive study and initiatory requirements, as well as keeping inner secrets guarded by the priesthood. Many ancestors died to preserve these traditions even in the face of slavery and persecution. For an outsider to come along and start wearing the false vestments of religious authority because they think an orisha is “pretty” or because “they love her” is insulting to the ancestors and reduces the ancient religious secret practices of that people to a mockery. Third, cultural appropriation can lead to people of the dominant culture assuming they have privilege and the right to practice minority indigenous religious practices in which they have not been trained or duly initiated. This can result in them tampering with energies, deities, spiritualities, entities, spirits and forces they are not ready to deal with. Simply put, when a person dresses a fierce indigenous spirit in a warm-fuzzy, culturally objectified, “rounded-corners for your protection” colonialist attitude, she’ll find herself tampering with a force that will unbalance her life in no time. 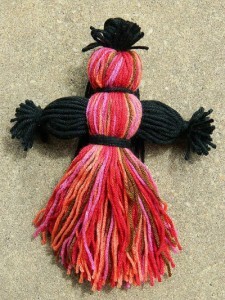 An “orisha spirit doll” sold by a vendor claiming it will allow the owner to petition the orisha Oya and gain blessings of prosperity. Oya is not worshiped in this manner, only spirits of the dead are housed in dolls in Lukumí practice. A common red flag warning you that a practitioner is culturally appropriating without formal training or without respect for the individual traditions he or she is borrowing, is when you see someone blending multiple spiritual paths into one practice. These are each separate and distinct spiritual paths that have nothing to do with one another. (Read our article on the difference between Hoodoo, Voodoo and Santeria.) As was previously mentioned the tribes from where these practices originate were often mortal enemies and at war with one another in Africa and would not blend their traditions nor cross their practices. Even Vodou which does include elements from Fon, Ewe, Yoruba and Congo people (who often warred with one another) has a fixed “reglement” or traditional order that is followed in their religious practices, and it is not a free-for-all religion. Simply put, these are distinct practices and religious traditions. Someone can certainly be initiated in multiple traditions but is rare to find anyone who is initiated in more than two of them. We’ve witnessed hoodoo spiritual supply shops selling “La Sirene/Yemaya” Oil, when these are two distinct and different spiritual forces from different tribes in Africa that never saw eye to eye. We’ve seen “orisha spirit dolls” which are essentially rag dolls like the doll babies made in hoodoo, but in the colors of various orishas. The vendors claim they can be used to help the owner obtain blessings, money, protection, etc. There is no way to know what these dolls contain, neither in terms of physical components, nor in the spirits that might decide to reside therein. Without proper consecration, a doll is just a house for some spirit … any spirit … certainly not the orishas. And any spirit would be happy to receive the worship and attention the owner of this doll would give it. We’ve seen online merchants selling a “Pomba Gira paquet (paket)” when pakets come from Haitian Vodou (where Pomba Gira is NOT worshipped) and Pomba Gira comes from Brazilian Kimbanda where pakets are not constructed nor used in her worship (not to mention that Pomba Gira is a CLASS of spirits and you need to specify which Pomba Gira you are working with). Pomba Gira would not be amused, nor would any initiated Vodowizan. A “Pomba Gira” spirit paket sold by a vendor with no training in Brazilian Kimbanda. Pakets come from Haitian Vodou not Kimbanda, and Pomba Gira is a class of spirits, not one specific spirit. This is typical of fraudulent tradition crossing. We’ve seen Etsy shops selling Palo trazos/firmas (sacred symbols of Palo Mayombe) when they are not initiated into Palo. We’ve even seen people selling Palo Trazos/Firmas drawn on cardboard like some kind of amulet to bring you money, protection or luck (even though trazos are drawn in the moment with chalk on the floor and are unique each time they are drawn and used . They are an instruction set to a spirit and without a nganga (pot) or a lucero they mean nothing.) Any palero would laugh at the illogic of this practice. 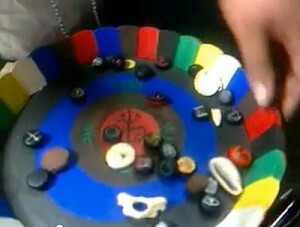 We even saw a YouTube video of an invented divination system called “hoodoo bone reading” that utilized orisha color symbolism and names from Santería practices but had Kimbanda pontos riscados dawn on a dish along with various random tokens representing different forces in a person’s life, and then tried to pass it off as Obeah divination. Which is it, Hoodoo, Santería, Kimbanda or Obeah? The answer is that it’s none of the above. This mish-mosh of practices is a sad attempt to lend legitimacy to a fraudulent practice by adding more “mystically foreign” elements to the mix. It’s the attitude of “OH! Add that in there too … it will seem more spooky and exotic, thus POWERFUL!” Not only is this shoddy spiritual craftsmanship but it also causes those who may be sincerely interested in learning these traditions great confusion. In the short time we’ve been online our church has received messages and questions from many people. We’ve had to explain to people that buying a catholic saint statue of Our Lady of Charity of Cobre does not mean you have received the orisha Oshun. That there is no such thing as palo “elekes”. That a hoodoo spell does not call upon the orisha Eleggua. That Yemaya cannot be contained in a mojo bag. And that you can’t buy a Fimo clay head made to LOOK like Eleggua online and think you actually have received anything of Eleggua. This kind of fraud has to stop, and it is important that we call it out when we see it. People are scammed out of thousands of dollars falling for these tricks. We at SAFE are doing our part to inform the public about non-traditional practice but also about what IS traditional. Knowledge of how things are traditionally done is more important than anything, and will help the public stay away from these snake oil vendors. Another common example of cultural appropriation with online vendors is the proliferation of “Eleggua” statues being sold online. Elegguá’s shrine traditionally takes the form either of a single stone, or a cement head-shaped shrine into which have been placed cowries. Each Eleggua should be unique to the individual, containing items as divined through diloggún or Ifá, and proper to the camino (road) for that individual. Eleggua is always made of durable construction (like cement or a rock) not clay, nor polymer clay (Fimo or Sculpey) . Elegguá’s shrine must then be washed and consecrated in a long ceremony by initiated olorishas or a babalawo, and then fed animal sacrifice or it isn’t anything. Remember – no blood, no orisha. We have witnessed red and black polymer clay sculpted heads being sold online with keys, feathers and cowries being jammed into the sculture. We’ve seen Eleggua-like heads sculpted out of play-doh, or red clay (claimed to have been hand-harvested from the great lakes region). We’ve even seen spirit bottles and mojo bags being made “for Eleggua” and sold as if they have anything at all to do with Eleggua. At best these are pretty crafts or art items, but they are most certainly NOT legitimate nor authentic Lucumí nor Yoruban shrines for the orisha Eleggua/Elegba. 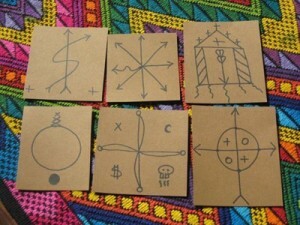 An online vendor sold these Palo Firmas drawn on cardboard as magical charms. The vendor has no initiation in Palo and these firmas are worthless without a nganga and palo initiation. This problem is becoming a quite rampant within the neo-pagan community. Neo-paganism is a valid and distinct religion but it is not Lukumi nor Yoruban religious practice. While they may feel they have the right to worship our orishas, our orishas have made it very clear the manner in which they want to be propitiated and worshipped. This is contained within Odu (the signs of our divination system), preserved by ancestors who gave their lives through slavery and persecution to retain their native practices, and perpetuated into modern-day by contemporary practitioners who continue and carry on the manner of worship taught by our elders. It is incredibly insensitive and offensive for someone outside of our religion to think they have the authority to run a ritual to one of our orishas when they have not been properly initiated in our manners. It is a huge example of cultural appropriation. Typically when these folks are challenged they’ll take one of two roads. The first direction are the folks who claim that “this is how I was taught by my family / mom / grandmother, etc.” (It’s interesting to note that no one ever claims their father or their grandfather taught them these things.) They claim to have been taught to make Haitian-Brazilian-Hoodoo items by family, or that they were taught that the orishas were part of Voodoo, or that “this is they way I was shown it was done”. No one in the USA even knew (or cared) about Pomba Gira until the 21st century and suddenly people are claiming they had family traditions that worked with her (although they have no ancestry in Brazil). Or some even claim to come from a family lineage of Chalcedonian witches – from ancient Chacedon in Turkey, who never worked with the orishas, pomba gira, the lwa, etc. Anyone who has a real root in these traditions would never condone that these practices be mingled. “Crowned Eleggua” statues made of polymer clay (Fimo) with keys and random items added in. 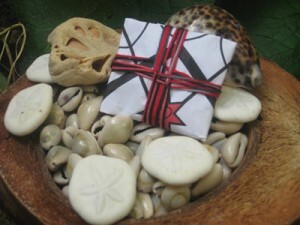 Eleggua must be made of a durable material like stone or concrete and customized through divination. These were sold online by PlanetVoodoo.com – image has been removed by the request of Denise Alvarado as she holds the copyright for the photo. The second road people usually take is to claim these practices as “their own private spirituality” and “how dare you question me or make me have to explain myself” for doing what they do. Well simply put, we as actual initiated priests and priestesses who entered igbodú (the sacred room), who wen through initiation, who paid our dues and sacrificed our lives for the orishas, are the culture bearers of this religion. We practice it as the priests who initiated us practiced it. We have verifiable lineages that are a testament to our initiation, to the preservation of our culture and to the perseverance of our ancestors in the face of adversity. We honor their sacrifice by practicing our religions the way they did – not by inventing stuff because “we feel we have the right to”. To those who are appropriating our religions, If someone steps up to call you out on your own “inventions” then don’t be offended when they call you exactly what you are… an inventor. Fly your inventor flag with pride and let people know “Hey this is my own mish-mosh I invented and it’s pretty and I like it”. That’s fine. But don’t try to pass yourself off like some kind of authority … neither by family lineage nor by self-rigteousness. To the public… ask questions about everything! If it’s boasts a lot and claims to be something authentic, do some research before you buy it. Ask around and see what others think of their practice. Ask outside of their sphere of influence so you can get an honest, unbiased opinion before hiring one of these individuals and always ask for credentials. A true santero or babalawo can tell you where they come from with specific names, dates and places, not veiled mysterious stories about family traditions, grandmothers or divine intercession. Great article Rev. E; a brilliant piece of writing and humbling. Clear and concise — thank you, Dr. E.
Thank you, I hope this clears up things for a lot of people. There are a lot of folks practicing some mishmash and calling it HooDoo. Very well said indeed. We might also add that not only are the priests and priestesses of our Lucumi tradition are offended by this appropriation, but also the Orishas themselves are offended by this total lack of respect. And there is no justification for this kind of thievery, regardless of what they might say, the appropriators. May Echu close all of their paths! . This article is right. Furthermore an article should also show the thiefs and people who overprice such initiations who are the cause of the things named in this article. You want people properly initiated, then make it realistically affordable. Dont try to make a rich living off it! This is a great article Dr. E! I wish more people of all faiths, cultures and heritage traditions would apply the information you have shared. Maybe then a soul or two would wake up to their own potential instead borrowing the potential of someone else. Best of Blessings. Very well written and thoughtful piece, thanks. COULD NOT HAVE BEEN SAID ANY BETTER. Modupe. BLESSINGS TO YOU ALWAYS. This is brilliant, Dr. E. Well-written, thoughtful, and hard-hitting with truths that simply are to important to ignore. If more authentic and ethical priests of these religions would stand together, we may have a great movement here. Thank you so much for this! This is well written, thoughtful, and covers all of the points I find myself bringing up over and over again when I run across this kind of cultural appropriation. I’ve linked it several places, and will refer people to it again and again. As a Vodouisant who belongs to a traditional sosyete that follows regleman, I also know how galling it is for me to hear people feel they can just claim bits and pieces of our traditions (of course as this noted, they always want the “pretty” parts! ), and to hear people act as if Oshun and Erzulie Freda are interchangeable, for example. Thank you again–what a wonderful piece, and I’m delighted to find this blog, so I can read more of your work! And to Miss Micheale, above, yes, I also thought quite about how the colonial mindset of the US and Europe makes some people even more likely to feel they have the “right” to take from others, because that is what has always been done in the cultures people grew up in. That history does not just go away, and it infuses attitudes in large and in more subtle ways. Thank you. Thank you very much for writing this. Welcome to Obeah you are an outsider I can see that, however I do agree with you and are on your side… I am an Obeah man and I don’t think Obeah practitioners should take from other ATRs without having initiations in those other ATRs and yet it is very common. I know many initiated Obeah practitioners from countries where it is practiced, all from different lineages. No lineage is identical but we all share elements that make a tradition recognized as Obeah. It is very possible the lady you mention in your article is Obeah it is also possible she is not, as what makes Obeah is not visible to the outside world and visible practices can be very individual or borrow from other traditions to give structure and there lies the problem. Thanks well said and very much on point. In some sense, though, appropriation IS the tradition in the West, and it goes back much further than colonialism. Abrahamic religions are of course a mish mash of ideas and practices that come from Egypt and all over the Middle East, as well as Greece. Christ was, for example, hardly the first savior to be born of a virgin, be killed, and rise again after three days. Judaism got its afterlife from the Egyptian faith, and Christianity its hell from the Zoroastarians. The pagan Djinn were incorporated into Islam. Western magicians followed suit (operating either from within a given priesthood or in parallel to it), and they are still doing that today. The Spiritualist movement was explicitly syncretic, their ideas were (influence by Hinduism) that all gods are really one, and they readily appropriated without understanding. The general Western misunderstanding of karma can be laid directly at their door. Add to all this people who were dissatisfied with what they saw as either the manipulative control of Catholicism or the staid, lifeless and meaninglessness of Protestant groups. All they could do was appropriate- there wasn’t really any where else for them to turn. It is not a surprise that this has become a norm. Thanks for your comment. I appreciate what you are saying, but what you are describing is cultural diffusion versus cultural appropriation. Cultural diffusion happens when one culture is exposed to another and the two naturally overlay with one another. For example, the usage of saint imagery in Santeria is an example of cultural diffusion because Cuba is a predominantly Catholic culture (and it is also an example of Colonialism in action because the missionaries in sub-saharan Africa were converting Africans to Christianity and Islam long before they were taken away in the slave trade). What we really describe in this article is the practice of literally taking religious imagery and cultural elements from a persecuted minority culture and applying them to foreign magical and spiritual techniques when that person has no training or license to do so. That would be like me sticking Buddhist statues inside of my orishas. I am not Buddhist, my culture does not diffuse itself with Buddhist culture and I am not trained in Buddhism at all. That is cultural appropriation. (And appropriation is a bit different from “cultural appropriation” just to be clear). Embarrassed as I am I must admit, although certainly not intentional, as I discover my spiritual path it seems so easy to incorporate and “cherry pick” individual aspects of others beliefs. I never associate with any title or attempt to sell my services, but I feel compelled to be honest and confess that after reading this article I am guilty of misappropriation of work others have struggled so hard to accomplish. No disrespect was/is intended, and now I think I must embrace my “Inventor” role and find my path honestly and without, what I now realize is, theft. It is hard to read something so well written and discover faults within one’s self and practice. Thank you for your work and for your teaching. I do highly recommend that you start working with your ancestors first and ask for their guidance and help!!! 😀 Not too many people are willing to admit that what they’re doing is wrong and cultural appropriation/theft. I do greatly admire the fact that you came out and apologized for having been a cultural appropriator. Even after some people who are guilty of cultural appropriation hear from initiated Priest and Priestesses about cultural appropriation and the dangers of it and how wrong it is, they get all defensive and start attacking the people who called them out on their BS. What’s so hard about just doing things the right way? What it comes down to is people wanting all of the power and prestige of having a title and being lazy and not wanting to be a real Priest or Priestess and doing the work that would be required of them and all they care about is making money off of innocent people that don’t know any better. Dr. E first off.. Ache, nsala malecum, and bastante luz! But understand to petition the orishas and mpungos.. you dont need any intiation and i feel you can use symbols and ceratin images to honor and petitio them. But i compleletly agree with these false vendors! What about wiccans blending with Wicca what they think it is Hoodoo, Voodoo (Vodou), Santería, Palo, Obeah and Other African-Diasporic Traditions just to make a fast buck? Please address those criminals. Solomon is no real Obeahman because if he was real, he would know that there is no such thing as initiation in Obeah but Solomon is right about lineage. Obeah comes from lineage and family traditions and not strangers being initiated for profit. Many outsiders cannot and will not understand Obeah. For some people in the Caribbean Obeah is just a word used to describe the metaphysics – theirs and those of other cultures. For example, the magical systems that the Haitians, Nicaraguans, Cubans, Brazilians would be called Obeah by a Jamaican. Some Obeah magicians use Egyptian magic, some even use evocation magic. Obeah has no rules and real Obeah men, Obeah women, Science man or whatever you want to call them use various magical systems to accomplish their goals. As a Westerner, you can never understand what Obeah is unless you born in an Obeah family. THERE IS NO INIATION IN OBEAH.. I have only heard about initiation online. Every Obeahman, Madda woman, Obeah woman, Science man are born in a family that practices Obeah they do not get initiated online by just anyone. The only initiation you will ever receive in the blood of the family you were born in. I know of two Obeah men and one Obeahwoman who told me about attending a secret school to refine their skills- not for initiations. In Jamaica, you do not get initiated in Obeah. You are born with a gift that is recognized by your family members. YOU CANNOT ATTEND AN OBEAH SCHOOL UNLESS YOU WERE BORN IN A FAMILY OF OBEAH PRACTITIONERS. If you want to see a real Obeahman in action look up Joseph the Obeahman. Joseph was never initiated in Obeah, he was BORN THAT WAY. Most Obeahmen that I know were taught by their fathers and/or grandfathers and the women are taught by other women in their families. I knew a Nicaraguan woman who was a GREAT Obeahwoman at 22. So when some people say that you cannot master magic at a young age, they know nothing about how Obeah people come about because they think that you can go to school and learn obeah. Children who are born into Obeah families are special children and their abilities are recognized at a young age. They either master the craft and refined their skills through family and ancestral guidance or they go to school but there is no initiation. The average Jamaican family would not be initiated into Obeah or claim to practice Obeah without it being part of their families for generations. The Nicaraguan’s entire family were Obeah practitioners and she was taught by her mother. If I talk about some of the adventures I had with that Nicaraguan, some of you might think that I am nuts and the stuff is unbelievable. The Nicaraguan had many Caribbean clients because, although, she was young, she was that good. I am Jamaica and although I do not come from a line of practitioners, I know more about Obeah than the average Westerner ever can grasp – even the ones who claim they are initiated. I can only speak of what happens in Jamaica and any Jamaica who practices obeah would be able to verify what I am saying. In Jamaica, there is a another magical system distinct from Obeah. These women are more organized in their practice than Obeah men and women. They are called Pocos and they attend Poco church. All members of that church are magicians. You may attend the church for help but you will never become a priestess if you were not born with the abilities. Obeah/Poco is not something you can just buy. Anyone who sells you Obeah or Poco abilities is probably scamming you or you are interested just so you can profit from another persons culture. I wish Catholicism and other Christian denomination was a profitable as African spirituality. Ebenezer White provides some very good information about Obeah and so far and he is even willing to initiated people but that is probably his way of making a buck. Because in Jamaica, no one would visit an Obeahman unless they know that his family are a line of practitioners. So I know that Mr. White is just following the Western way of commercializing African magical systems. And if you notice, he claims, if the spirit calls you are entitled to an initiation because he very wells knows that the spirit would call you if you were part of a family of practitioners. I was offered initiation into African American Hoodoo and I refused because initiating just anyone is not common practice in my culture but it would be done by charlatans for profit. And not all Obeah practitioners do dark arts. I like how the image of Denise Alvarados sancochero Ellegua has that banner over it. Someone certainly is touchy…. You are so missed and loved Dr. E.!!! Rest In Peace!!! Ase’ O’!!! Give thanks to Rev. Dr. E, for the defending & maintaining of traditional African culture. I was in a initiatic Kemetic school (theearhcenter.com) which was founded & run by a High Priest & Healer from the Dogon tribe & while involved in the instruction, I became very aware of how the traditions of indigenous people are continually appropriated for profit as well as for disparaging the continuation of these spiritual/cultural traditions. Highest respect to you & may you be in a honored place among the Egun (Ancestors). Also, I will be passing along information about this article & the much needed group you set up, S.A.F.E., to the traditional healers & organizations I know, as this should be an Indigenous Peoples Movement to maintain the integrity & quality of traditional spiritual workers & healers worldwide. Duaoo (Thank you) and Ma’at Hotep (Be at peace/pleased in the truth, justness & foundation of natural and social order and unity).